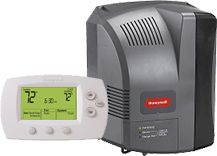 Free humidifier (Honeywell HE300) or equivalent with purchase of new heating system, high efficiency furnace or new high efficiency heat pump system. Free programmable thermostat (Comfort Programmable Thermostat) or equivalent with purchase of new air conditioning unit. Honeywell HE300 Powered Humidifier Installed for for only $599 https://shemtovsystems.com/product_post_type/honeywell-he300-powered-humidifier-installed-495/ 1.0/5 based upon 2 reviews.